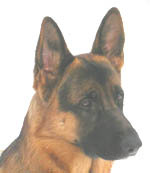 The head is wedge-shaped and in harmony with the dogs size (length app. 40% of height at the withers) without being coarse or overly long. The head should appear dry, and moderately wide between the ears. Seen from the front and side, the forehead is only slightly domed, the center furrow is either absent or only slightly visible. The length ratio of skull to face is 50 : 50%. Skull width approximately equals skull length. Seen from above, the skull slopes into a wedge-shaped muzzle. The stop should not be pronounced. Upper and lower jaws are strong, the bridge of the nose should be straight, not a Roman nose or dish-faced nose. Lips are taut, well closed and of dark color. Females: Height at the wither 55 cm to 60 cm Weight 22 kg - 32 kg. Faults of Dentition: All deviation from scissor bite and number of teeth, unless they are disqualifying faults.